Jewelry is always fun no matter what stage of life you are in and it always fits which makes it even better. Check out Every Super Mom Needs Jewelry to see some of the great pieces that the 7 Charming Sisters have available. 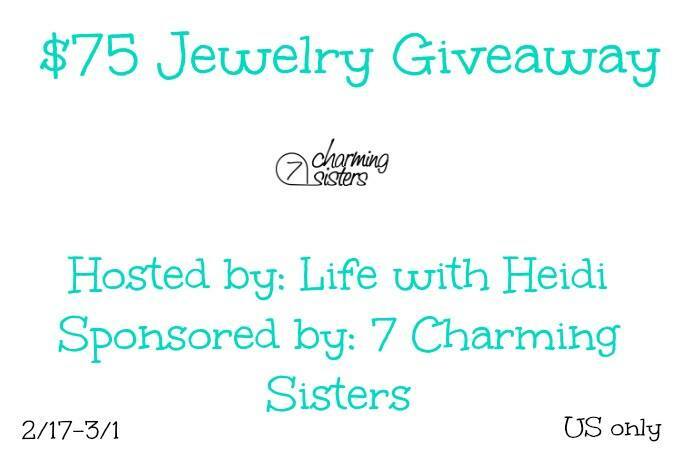 Then be sure and enter for your chance to win $75 worth of 7 Charming Sisters jewelry, picked by the company. 7 Charming Sisters not only sells trendy jewelry, but also delivers a lifestyle experience based on the behind-the-scenes fun they have everyday. Although it is a fun studio to work at one might think they are all play, but they are able to work and have fun which is an amazing atmosphere. They also employ people who have disabilities to work in their studio. Some of their handmade jewelry is also made by people with disabilities and they then earn commission from each of their items that sell. 7 Charming Sisters has an amazing array of jewelry to fit everyone's style, shipping time was minimal and the customer service was fantastic. 7 Charming Sisters is responsible for shipment of the prize not the individual blogs helping promote this event. Disclosure: We reserve the right to make revisions, to cancel, or suspend this contest for any reason. We are not associated with any of the companies named above. The odds of winning are based on the number of entries received Open to the US 18+ only. Confirmed Winner(s) will be contacted by email. Winner(s) have 24 hours to respond before a new winner is chosen. No purchase necessary. Void where prohibited by law. The sponsor(s) will be responsible for product shipment to winner(s) of this giveaway. Life with Heidi (and any other blog participating) is not responsible for product shipment/delivery. This event is in no way administered, sponsored, or endorsed by, or associated with, Facebook and/or Twitter, Google, Pinterest. This disclosure is done in accordance with the Federal Trade Commission 10 CFR, Part 255 Guides Concerning the Use of Endorsements. Entrants must only enter with either one email address, IP address and/or Facebook account, anyone found violating these rules will be disqualified. It is at the sole discretion of the admin of the giveaway if the winner has met the rules or not. Please email me at heidi@lifewithheidi.com with any questions or concerns. I like their FAMILY FIRST JEWELRY SET! I like the FAMILY FIRST JEWELRY SET. It's a complete set with ring, earrings, bracelet and necklace! I like the SING TO THE MOON JEWELRY SET. I like the chocolate milk & honey necklace. I love all their sparkly jewelry, but the one that catches my eye is the AFFINITY FOR BLING NECKLACE. I think it's because of all the aurora borealis oil slick colors that draw me in. I really like the Black Magic Necklace it would go lovely with any nice top. It would look even better in the summer time out on the town with friends for dinner/dancing. I like the Always My Baby Necklace. Thank you for the entry.